This course educates you to detect the early signs, as well as the chronic signs of the temporomandibular dysfunction syndrome. 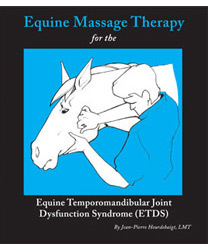 Come and get instructions in the massage and stretching techniques from a recognized expert in the field so you can bring the well-known benefits of massage to help any horse recover from this debilitating condition. The basics of the equine TMJ anatomy (bones, nerves, vessels, joint). The muscles of mastication with an in-depth anatomy description. Simple tests to check the health of the TMJ. Precious information on the signs and symptoms for all phases of ETDS (acute, sub-acute & chronic phase). Excellent massage routine outlines for each phase (including hydrotherapy). Acupressure point to assist vitality flow. Preventive or palliative massage for ETDS will ensure a good TMJ performance. This will result in a good sensitivity in the horse’s mouth for increase finesse in riding and secure a good mastication apparatus for a better mastication and absorption of his food and its nutrients. Also, a healthy TMJ contributes to a better overall sense of balance for the horse. This course will develop your skills and confidence in dealing with ETDS. The knowledge gained from this continual education will allow you to, in a natural way, actively prevent this condition as well as participate in the recovery of a horse already afflicted with ETDS.